More than 270 employees and invited guests from the municipality and the canton - among them Councilor of State and Director of the Economy for the Canton of Fribourg, Dr. 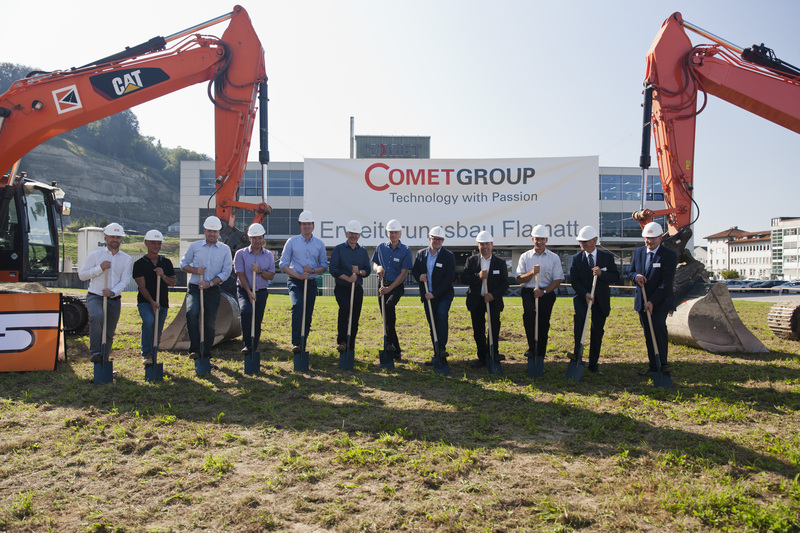 Beat Vonlanthen, and the Mayor of Wünnewil-Flamatt, Andreas Freiburghaus - came together today in a ground-breaking ceremony to celebrate the official start of building work on the extension to the COMET Group's premises. The extension will create some 20,000 square meters of additional production space and hence room for around 250 more workers at the Flamatt HQ. The plan is that building work will be completed in mid-2018. At its headquarters in Flamatt, COMET Group develops its core components based on X-ray, high-frequency and ebeam technology. "As a result of its strong growth in recent years, our company has reached the limits of its production capacity in Flamatt. Today marks an important milestone in the implementation of our growth strategy. 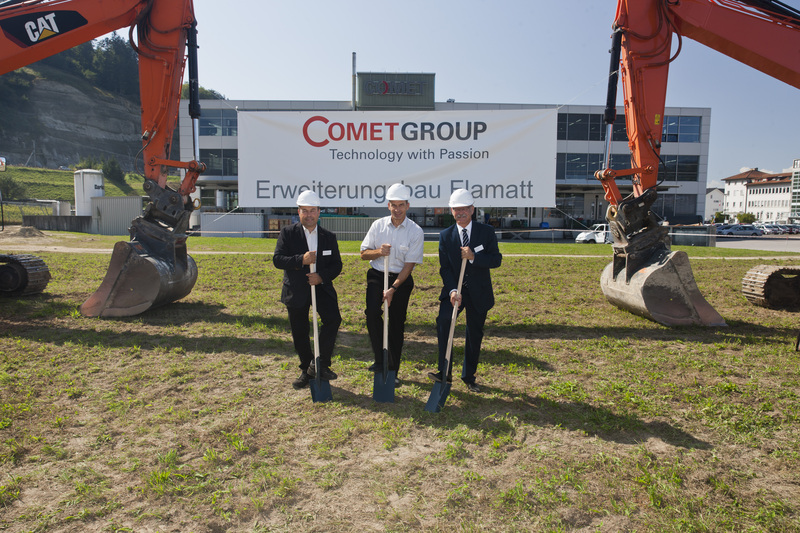 Our production facility in Flamatt, with its qualified professionals, enables us to maintain a constant quality in the high-tech products we make," said Ronald Fehlmann, CEO of COMET Group, at the ground-breaking ceremony for the extension building today. The technology group's production capacity at its Flamatt HQ is heavily utilized, and is now being extended by 20,000 square meters to over 37,000 square meters. The extension to the building will create urgently needed space for the expanding X-ray and ebeam business. In the longer term, it is intended that it should be the workplace for up to 250 additional staff. By investing some CHF 60 million in the extension, COMET Group is affirming its clear commitment to Switzerland and the Canton of Fribourg. "Flamatt has been the group's home since 2003, and what we value in particular about the place is the first-rate support we get from the municipality and the canton, not to mention the very good transportation links," added Mr. Fehlmann. Director of the Economy for the Canton of Fribourg Dr. Beat Vonlanthen expressed appreciation for this commitment to the region: "Over recent years, the Canton of Fribourg has made great efforts to make itself an attractive location for businesses from abroad and from other parts of Switzerland. COMET Group is a major and innovative employer in the region and has extremely tough competition from abroad to contend with. We see the COMET Group's desire to expand its production at its existing site in Flamatt and to create more jobs here as confirmation that we have indeed created the conditions for productive industry, and also as placing us under an obligation to maintain those conditions carefully." Andreas Freiburghaus, the Mayor of Wünnewil-Flamatt, added: "We're proud that one of the world's major manufacturers of X-ray, high-frequency and ebeam technology has chosen to make its home among us and is creating attractive jobs for highly qualified workers here." 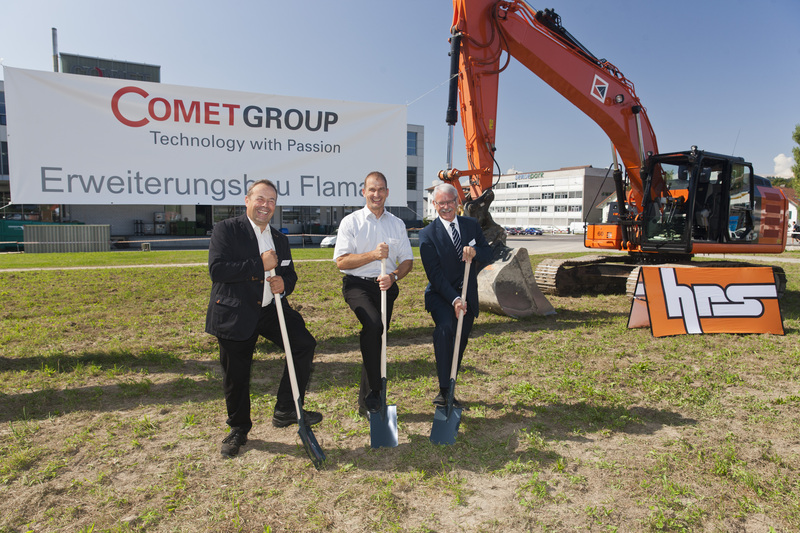 Since moving into its headquarters in Flamatt 13 years ago, COMET Group has grown from a Berne-based company with 230 employees into an international technology group that now has 13 sites and some 1,100 employees worldwide. In that time, its revenue has almost quadrupled from CHF 74.3 million in 2002 to CHF 282.3 million in 2015. "We don't doubt that, despite the strength of the Swiss franc, COMET Group can, thanks to its innovative technologies, qualified and dedicated staff, and high productivity, continue to advance and achieve further success in the future," said CEO Ronald Fehlmann. The extension project has been managed by Burckhardt+Partner AG as general planner and architect. HRS Real Estate Ltd has been engaged as general contractor to build the extension.